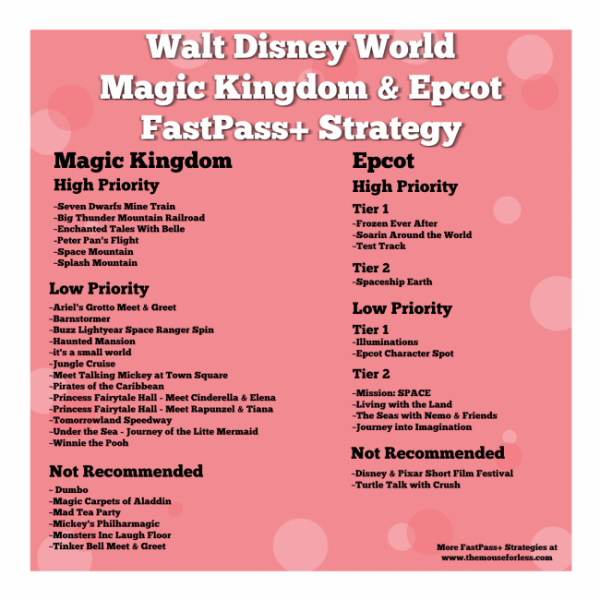 FastPass+ (FP+) is a great system that lets you reserve up to 3 attractions or entertainment experiences in advance for each day of your Walt Disney World vacation. You can find out more details about the FP+ system, including when and how you can make your reservations, in our FastPass+ Guide. Note: Many seasonal or limited time events, such as the Eat to the Beat concerts have historically offered Fastpass+ when they occur. Those have generally been in Group 1. You may have noted above, Fastpasses for Epcot come in two groups, or tiers. When you make your initial reservations, you can select a maximum of one attraction from group one, and then two selections from group two. Here are a few tips to help you decide which three experiences you will choose. The Epcot FastPass+ strategy requires guests to make decisions about what is most important to them. The biggest challenge for guests is that Frozen Ever After, Soarin’ and Test Track are all in Group 1, so you are only able to select one of them. If you and your group are up for anything and just want to experience all that the park has to offer, the attractions for which FP+ will save you the most time are generally Frozen Ever After, Spaceship Earth, and Meet Disney Pals at the Epcot Character Spot. If you don’t plan on participating in any character meets, you could replace the Character Spot with Mission Space. If you still wanted to experience Soarin’ and Test Track with as little wait as possible, the fastest way to do that is probably to head straight to Soarin’ when the park opens, and then ride Test Track through the single rider line. Additionally, you now do not have to select three experiences in advance, so you could just decide to only select one or two of these to free up your plan that day. The attractions that generally have little to no wait include: Living with the Land and the Pixar Short Film Festival. If you are visiting Epcot with small children, you most likely should choose Frozen Ever After for you tier 1 selection. Since this is a brand new attraction, and one of the most appealing attractions for children in all of Epcot, Fastpasses will likely be harder to come by, and standby wait times will likely be long. If you think you will want to experience this attraction, try to get a FP+ for it. However, you have a decision to make – essentially whether you are planning on staying for Illuminations. If so, getting a Fastpass for that show could be valuable for your group preventing you from having to wait as long or worry about as many people blocking your group’s view. If you aren’t sure if you will stay that long in the park, or know you won’t, you should not select Illuminations as your Tier 1 Fastpass. For group two, the two child-centric options that will generally save you’re the most time are The Seas with Nemo and Friends and Journey Into Imagination with Figment. The lines for Journey Into Imagination can be a little unpredictable, so if you have a Fastpass but the standby line is short, your next best option to save time is probably Spaceship Earth. At the moment, the Epcot FastPass+ options for Thrill Seekers in Epcot are a little limited. 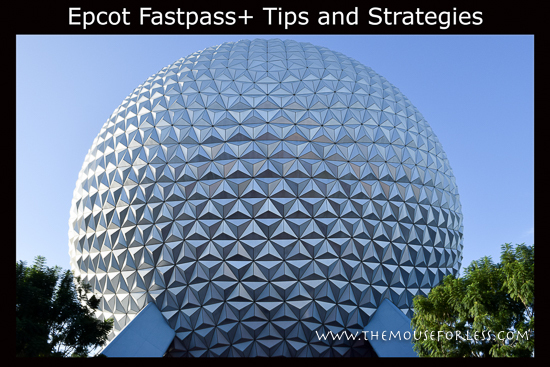 You should definitely get a Group 1 Fastpass for Test Track and a Group 2 Fastpass for Mission:SPACE Orange. Soarin’ is also a fantastic option, although less of a thrill ride. Illuminations is a special case for Epcot Fastpass+ planning. In just 12 minutes, you can “behold the past, present and future of Earth at this stunning fireworks show that celebrates the spirit of humanity.” This nighttime spectacular is a favorite of many Disney guests, but also occurs at the end of the night. As such, selecting Illuminations as one of your initial three FP+ selections means that you will not be able to add additional Fastpasses throughout the day. You are arriving to the park late in the day and Illuminations is one of your top priorities. Your group includes small children, as outlined above. You don’t want to ride any rides, just see shows. If you don’t fall into any of those categories, but would like a way to reserve seating for Illuminations, there is still yet another option for you. Disney offers Illuminations Desert Parties on select nights. These parties are extremely nice and offer excellent viewing locations for the fireworks along with food selections.